I mainly share recipes that my family enjoys, but once in awhile I like to share a recipe that I do not particularly care for but has rave reviews by others. 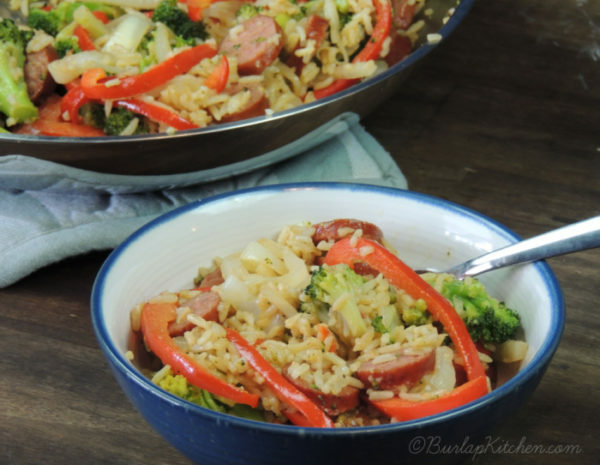 One of those is this recipe for Turkey Kielbasas Stir Fry. This is one of my mom’s recipes. She also happens to be a genius in the kitchen, which is probably where I get it from! When I get stuck or need some inspiration I normally turn to her for advice. As mentioned, this is not on my favorite recipes, and it’s mostly due to the fact that it includes onions and peppers. Those are not my favorite. But, I do enjoy a good stir fry from time to time. And one thing that I know about is stir fry is that the broccoli has to be crunchy. Of course, if you prefer a softer broccoli you could always steam yours in the microwave for a few minutes. But, I think that crunchy vegetables is what makes a stir fry a stir fry! I used Turkey Kielbasas in this recipe, but you could always substitute with chicken if kielbasas isn’t really your jam. But before you do that, I think you should at least give the Kielbasas a try! You might be surprised! I know I was! Drizzle large frying pan with olive oil and turn onto medium-high heat. Cut Turkey Kielbasas into chunks and toss in frying pan and brown. While Kielbasas is cooking, cook the jasmine rice according to the package. Once Kielbasas is browned, add peppers, onions and broccoli. Stir for about 3 minutes. Add Marinade and finish cooking until broccoli is done. Add cooked rice.